In our text today, we see the Apostles listed by name. But these men were more than names, they were real people. They got on one another’s nerves, they had great strengths and great weaknesses. One of them, Judas, was insincere. The other 11 were sometimes dense, stubborn, blinded by their preconceived ideas, and wavered in thier faith and commitment. These Apostles were men being transformed; we see them in the process of transformation. Christ would take these diamonds in the rough, this raw material, modify their personalities, and develop their spiritual depth. From Christ’s intense ministry with the Apostles, we can see that God looks beyond what we are to what we can become. He wants us to enter the process of transformation and to continue on in that process. Let’s look at just two of these flesh and blood, far from perfect Apostles, men not unlike ourselves. No other disciple was so praised and blessed by Jesus, and yet no other did He call Satan. Peter was vacillating and unstable, but Christ would work with Him to develop Him into a Rock who would open up the church to the Jews at Pentecost and later to the Gentiles when he baptized Cornelius. 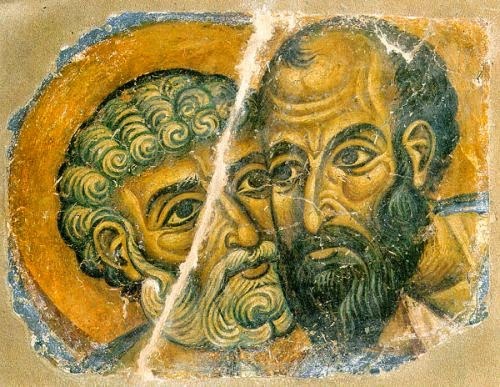 Bust in John's Gospel, Peter is asked to affirm His love for Christ 3 TIMES! Are you an unstable, vacillating person? Are you never content for long? Do you speak first and think later? Do you boast of great feats and dumb mistakes? Enter into the discipleship process with Jesus, and He’ll work with you. You’ll always be you, but you’ll be a better you, like Peter was.